This stunning image shows remarkable and mysterious details near the dark central region of a planet-sized sunspot in one of the sharpest views ever of the surface of the Sun. Just released, the picture was made using the Swedish Solar Telescope now in its first year of operation on the Canary Island of La Palma. 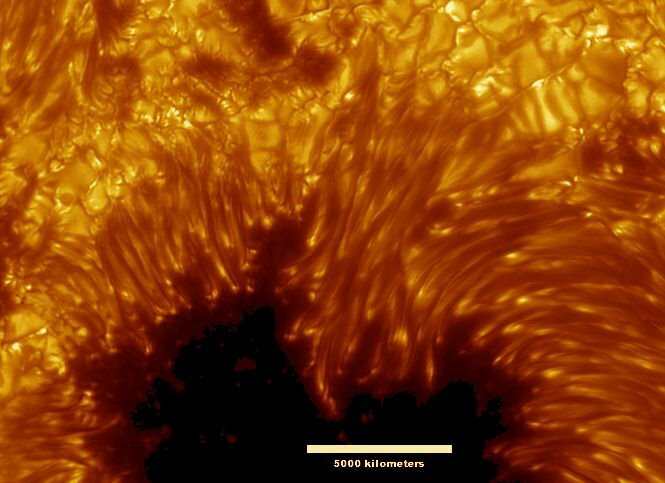 Along with features described as hairs and canals are dark cores visible within the bright filaments that extend into the sunspot, representing previously unknown and unexplored solar phenomena. The filaments' newly revealed dark cores are seen to be thousands of kilometers long but only about 100 kilometers wide. The Symbol of the Sun : The sun has always been symbolized as something special to spiritual quest. As Sufi Inayat Khan says, "The sun is the centralizing of the all-pervading radiance. In other words the all-pervading radiance has gathered itself together in order to centralize in one spot, and this has become the source of the creation, the whole physical manifestation. So the omniscient Spirit by centralizing in one spot has become the source of the whole seen and unseen manifestation. It is therefore that in all ages the wise have worshipped the sun as the symbol of God, although the sun is only the outward symbol of God. Light has the greatest attraction for the human soul. Man loves it in the fire and in things that are bright and shining, and that is why he considers gold and jewels as precious. The cosmos has a greater attraction for him than the earth, because of its light. As man evolves he naturally ceases to look down on the earth, but looks up to the heavens. The most attractive object that he sees is the sun in the heavens, the sun which is without any support and is more luminous than anything else surrenders himself to beauty, he bowed to the sun, as being the greatest beauty in heaven, and man took the sun as nature's symbol of God. This symbol he pictured in different forms. In Persia, China, Japan, India, Egypt, whenever God was pictured it was in the form of the sun. In all ages man has pictured his Prophet, Master, Savior, with a sun around his head. In ancient Persia there used to be a gold disc behind the head of the king, picturing him as the sun, and they used to call this Zardash. The name Zarathushtra has the same origin; the word simply meant the gold disc. In Hindu temples and Buddhist temples around the image of different Avatars there is this sign of the sun, and this symbol was used both in the East and in the West in turbans and hats. Man, as is his nature, has blamed the sun worshippers and mocked at them, but he has never been able to uproot the charm, the attraction for human souls held by the sun." Tag: Sun, Spirituality , God, Sufi.